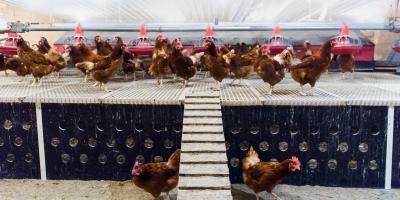 Do egg farms ever get inspected? 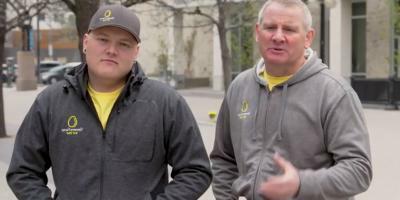 Registered Canadian egg farmers take part in a national Animal Care Program and comprehensive on-farm food safety program, called Start-Clean, Stay-Clean™. These national programs set out important guidelines, based on the latest research and information, and were developed by Canada’s leading experts. Farms are inspected by trained field inspectors and audited against Egg Farmers of Canada’s national programs. Learn more. What is a Grade A egg? There are three main things that determine Grade A quality of an egg: the condition of the shell, the position of the yolk, and the size of the air cell inside the shell. If the shell has no cracks, the yolk is centered and the air cell is very small – it meets Canada Grade A standards. These are the eggs you buy at the store. 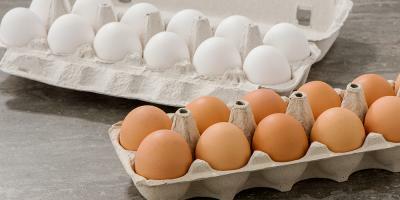 Are white and brown eggs different? Aside from the colour of the eggshell, there is little difference between brown and white eggs. The eggshell colour depends on the breed of the hen. Generally speaking, white shell eggs come from hens with white feathers, while brown shell eggs are produced by hens with brown feathers. Nutritionally, both brown and white eggs are identical unless the feed has been enhanced for speciality eggs such as Omega-3. What time does an egg farmer's day start and end? The day on the farm starts when the lights go on in the barn. On Susan Schafers’ farm, this is 6am. Floor eggs at her free run operation are gathered at 7am, which is an opportunity to walk through the whole barn. Following that, she works on paperwork and record keeping for the national Start-Clean, Stay-Clean™ program and Animal Care Program including water, humidity and temperature checks. Next up is egg gathering which takes about an hour, followed by a break. A second egg gathering and barn check happens later in the morning, and for the rest of the day the hens can do what they like. A third barn check happens in the afternoon with more record-keeping, and her day ends with a final barn check around 7-8pm. How many eggs does a hen lay a day? A hen will naturally lay on average, an egg almost once a day. Are there steroids and hormones in eggs? In Canada, you can trust that eggs are always free of added steroids and hormones. 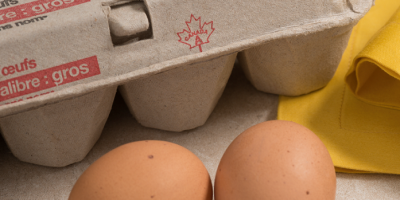 Canadian egg farmers follow feed regulations set by the Canadian Food Inspection Agency, part of which states that added steroids and hormones are not approved for use in Canada. 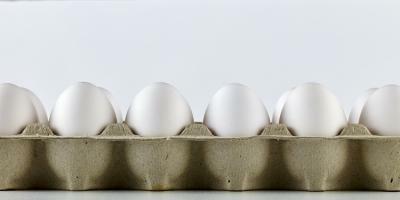 This means that the eggs you buy at the store do not contain added steroids or hormones. 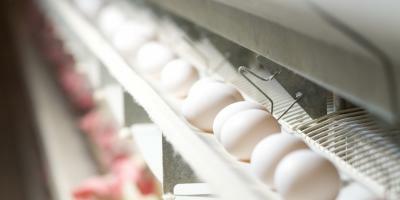 What is an egg grading station? 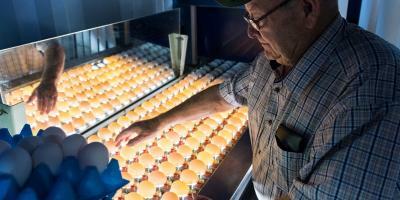 Once eggs have left the farm, they go through the grading station where they are washed, candled, weighed and packed. All grading stations are registered and inspected by the Canadian Food Inspection Agency. 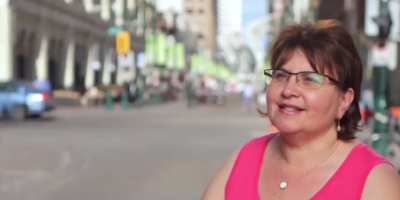 Why does environmental sustainability matter to Canadian egg farmers? Environmental sustainability is important to farmers – it ensures a bright future for the next generation. It comes naturally to Canadian egg farmers, some of whom have been producing food on the same lot of land for generations. Over the past 50 years, Canadian egg production has increased by 50%, but the environmental footprint of Canadian egg farms decreased by 50%. We aim for continuous improvement, seeking new ways to make egg production even more environmentally sound. 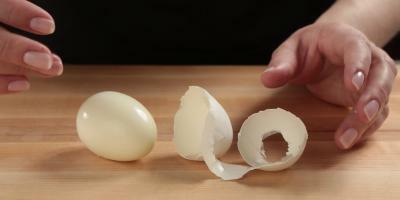 What makes some eggshells thinner or thicker than others? As a hen ages, the eggs that she lays get gradually larger. However, the calcium content deposited in the shell remains the same despite the size of the egg. So, the eggshells become thinner as the hen ages. The newest infant feeding guidelines from Health Canada, the Canadian Pediatric Society, Dietitians of Canada and the Breastfeeding Committee for Canada now recommend introducing whole eggs starting at six months of age, or as soon as your child starts eating solids. 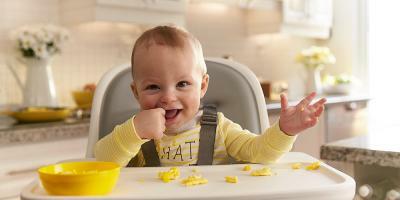 Experts no longer recommend delaying the introduction of common allergens to twelve months. In fact, research shows that introducing whole eggs early can actually help to lower your baby’s chance of developing an egg allergy. Learn more. Why do I see some eggs with a code? In some parts of Canada, a code is stamped onto the eggshell. 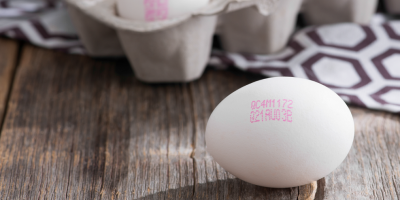 This code is part of a traceability system which identifies information like the farm where the eggs comes from, the place it was graded, and the best before date. Through programs like this, we are able to ensure Canadians have a constant supply of fresh, safe and high-quality eggs and that you continue to have confidence in the food you buy for your family. What's the difference between free run and free range eggs? Free run eggs come from hens that roam the entire barn floor. Some of these barns may be equipped with multi-tiered aviaries. Free range eggs come from hens that roam the barn floor and when weather permits, go outside to pasture. Outdoor access is only seasonally available in Canada. There are no differences between the nutrient content of these eggs and classic shell eggs.